It was in the early 1900s that William Lawrence Murphy invented the fold-away bed that still bears his name. In recent years, the design has improved by leaps and bounds, becoming a convenient, space-saving solution for a home of any size. 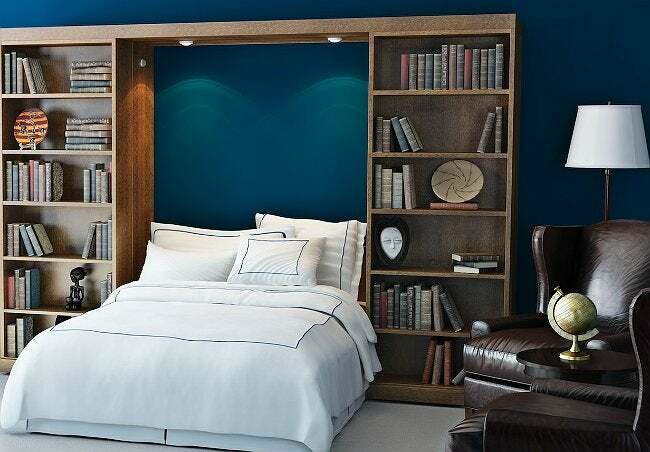 If you need an extra bed in your abode but don’t have the space for an additional bedroom, why not choose a Murphy bed? Murphy beds are great space-savers, helping single rooms to perform multiple functions. For example, with a Murphy bed, an office or den can double as a small bedroom. Hinged to the wall on one end, a Murphy bed can be stored upright when not in use. The mattress is attached to the bed, usually with straps, to keep it in place during storage. When you’re ready to use the bed, built-in springs and counter-balancers help you lower it into place. Since the early models, numerous options have been introduced, such as integrated shelves and lighting. Some recent models also give you the option of hinging the side of the bed, not the end of it, to the wall. And if you need bunk beds, there are options for that too. If you do decide to go the Murphy bed route, be sure you get a well-built model counterbalanced to operate smoothly. That way, you won’t end up spending the night under the bed rather than in it!